Today we’re bringing back the series that takes a look at the top five jerseys worn by a particular player. 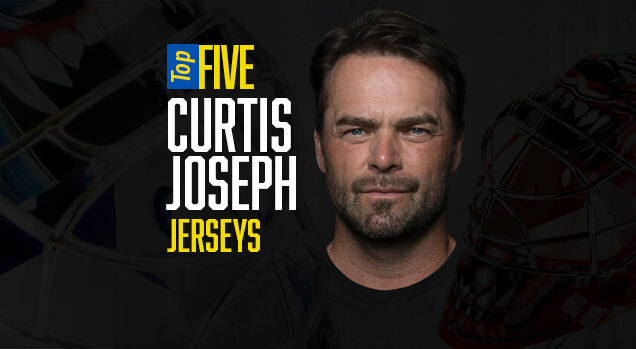 Up next, it’s a top five for #5 on the all-time list for goalie wins: Curtis Joseph. 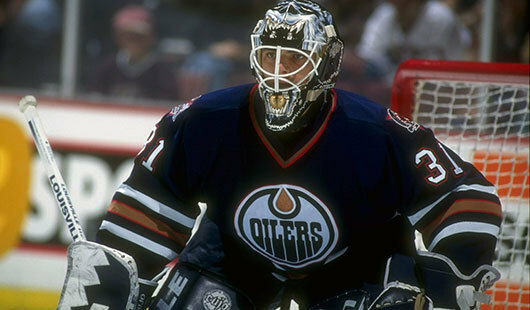 He has recently been in the news for the release of his book, Cujo, and the subsequent Canadian tour in support of the memoir that details his untold story of life on and off the ice. 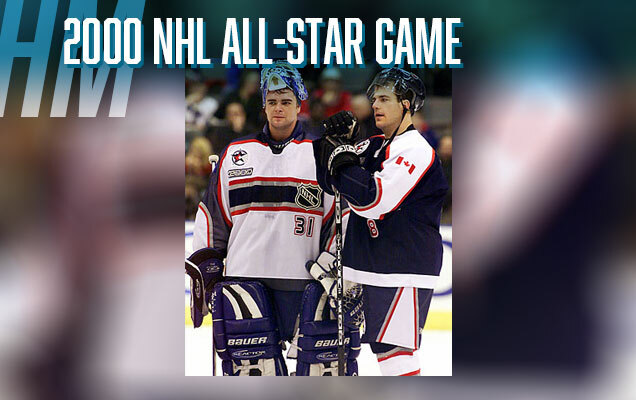 With tenures in St. Louis, Edmonton, Toronto, Detroit, Phoenix and Calgary, along with multiple Olympics and All-Star games, Cujo’s long and successful career saw him sport some truly iconic jerseys along the way. This will definitely be a lightning rod for being mentioned on this list. The actual design really only gets points for the effort and its ability to uniquely capture a moment in time: the futuristic vibes of all things 2000. 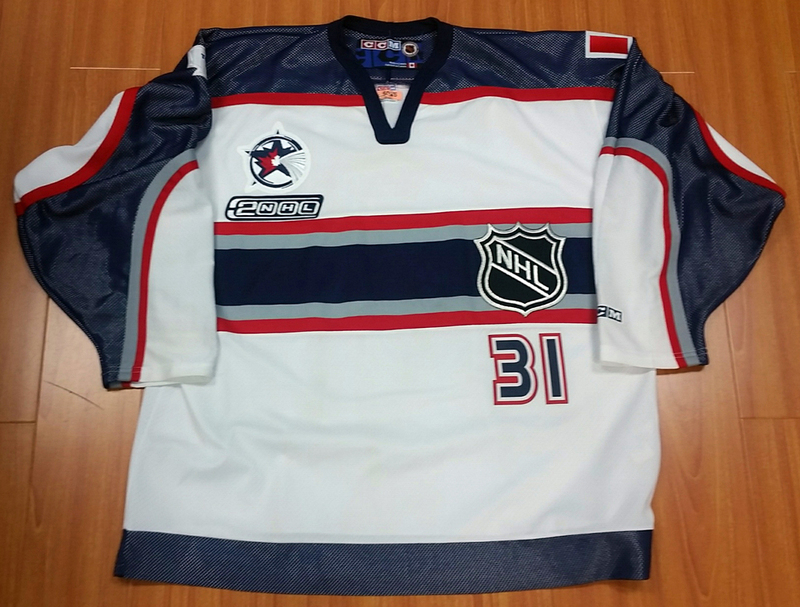 Back then nearly every avenue of design had a “futuristic” look and this jersey is no exception. From it’s asymmetrical layout to the number font, it perfectly captures the year and era of Y2K. Show this design to a non-designer, or even a non-sports fan and give them one guess at the year it was worn and it’d be a safe bet the vast majority would take a guess and say, “Um, i don’t know…2000?” Now that’s design intent. Ok, many hockey fans and design enthusiasts will say, “How can these iconic looks not be ranked higher? !” ….well, there are a couple of factors. The first is association: when thinking of Cujo’s career, the red and white of the Red Wings is most likely the fourth jersey that comes to mind. Because of this, it gets docked in his overall ranking of jerseys worn. Joseph’s stint in Detroit was up-and-down, with regular season successes met with falling short of the playoff expectations of Hockeytown. The second is comparison: Cujo’s tenure in Toronto included these white alternate jerseys that, at the time, featured a vintage iteration of the famed maple leaf logo design. As a standalone jersey, these are very solid. However, this jersey and logo eventually evolved into an improved version that the Leafs currently wear today. So by comparison they fall short when ranking the overall design. Both of these jerseys execute design simplicity very effectively: one color accented with white, traditional striping patterns and iconic logos make each one a classic. 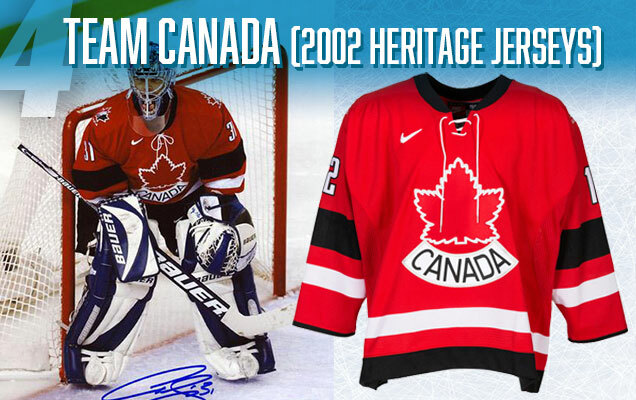 The next jersey on the list is golden, as in a Gold medal winner from the 2002 Olympics. Team Canada sported four different jerseys on their run toward Gold in 2002, but the red “Heritage” version was by far the best. As this list proves, it’s hard to go wrong with a vintage-inspired maple leaf design and these Team Canada jerseys are no exception. Thick, bold stripes are accompanied by a laced collar to round-out this excellent look. The Canada wordmark features a thin weight san serif font that works very well as an upward arch below the maple leaf, a type of text treatment that is typically underused in logo design. In some rankings this jersey could easily top the list, but in Cujo’s case it proves that his career featured a plethora of excellent looks. Talk about a strong brand. 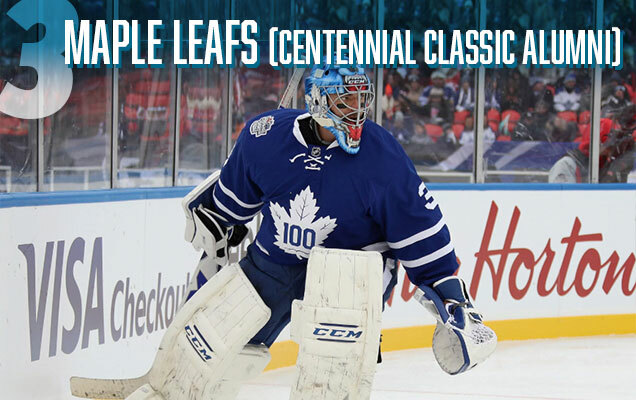 The Maple Leafs trotted out these beauties for the 2017 Centennial Classic Alumni game in Toronto and nowhere to be found on the jerseys were the words “Toronto” or “Maple Leafs.” The outdoor game celebrated the 100th season of the Maple Leafs, and the beginning of the NHL’s centennial year. A scenario that resulted in the perfect opportunity to simply feature “100” in the center of the famed maple leaf logo design. It seems so simple, yet it’s such a brilliant example of thoughtful design that really exemplifies the strength of the Maple Leafs brand. It’s a legendary look, only fitting that Leafs legends got the opportunity to play a game in this unique jersey. 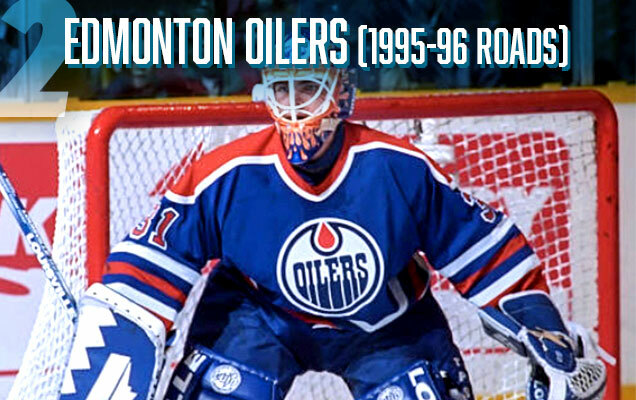 Cujo’s first year with the Oilers saw him sport the best jersey in Oilers history: the classic royal blue and bright orange home jerseys. The following year the Oilers switched to their very regrettable navy, red and bronze phase that unfortunately lasted well over a decade. Lucky for Joseph, he got to spend one season in these blue and orange classics before the franchise made that switch. The color scheme works very well on the ice and is nicely accented by thick white striping that really makes the color combination pop. The distinctive typography and oil drip of the Oilers logo sits perfectly on the chest of these jerseys that utilize a traditional shoulder yoke and striping pattern. Here’s to hoping the Oilers bring back this jersey as their full-time home look and get rid of the inverted orange versions they currently sport. The ‘89 – ‘94 Blues home jersey takes the top spot, and one of the reasons why is the same reason why the Red Wings jersey started our list: association. A beautiful thing about design is that it can elicit emotion and nostalgia whether you’re a design expert or even someone who “doesn’t care” about design, branding or how a jersey/uniform looks. Design can create connections and in this case, a personal association. For this particular design enthusiast, this Blues era of Curtis Joseph represents my introduction to the NHL, the coolness of Cujo (and goalies in general) and the start of a passion for hockey. Plus, personal reasons asides, it’s just a great jersey. The blue note logo is one of the more unique logos in not only the NHL, but in all sports. It represents the jazz history of St. Louis and has been largely the same (with a few tweaks over the years) since the Blues inception in the late 60’s. 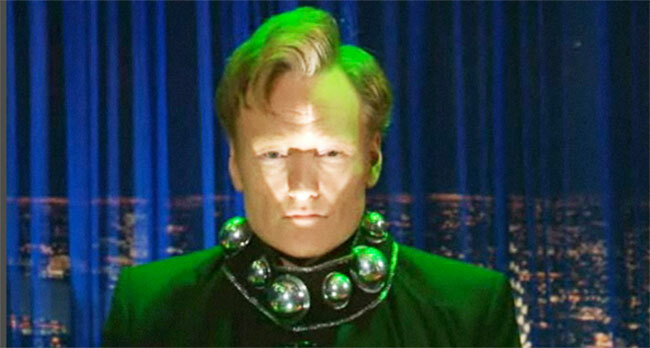 It’s a logo that has withstood the test of time. The angle of the winged note does an excellent job of conveying motion, thus making it a perfect jersey crest for the symphony on ice known as hockey. Cujo is one of the best goalies of all-time. 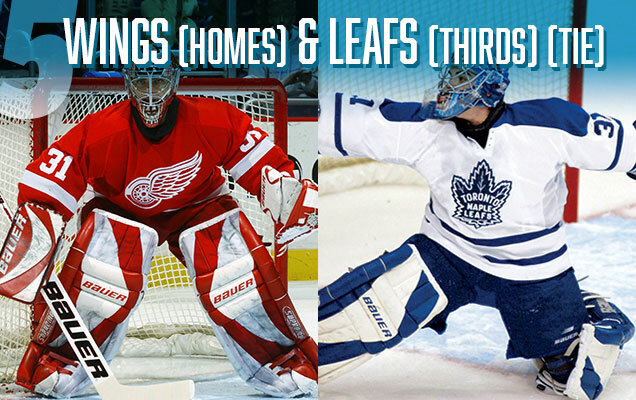 His acrobatic saves, fiery style of play and ability to win games has endeared him with multiple NHL fanbases. He had the opportunity to suit up for iconic franchises during his playing career, which resulted in sporting some absolutely classic jerseys. Ranking the top five definitely proved difficult, and like many aspects of design in general, will be sure to spark debate. All-in-all, every jersey on this list is excellent, with the top two being elite looks. Either one could have easily taken the top spot, and it was essentially a personal connection that ultimately decided the order. Cutoff had some great masks in his career too but my favorite is the trumpet mask he wore with the Blues. 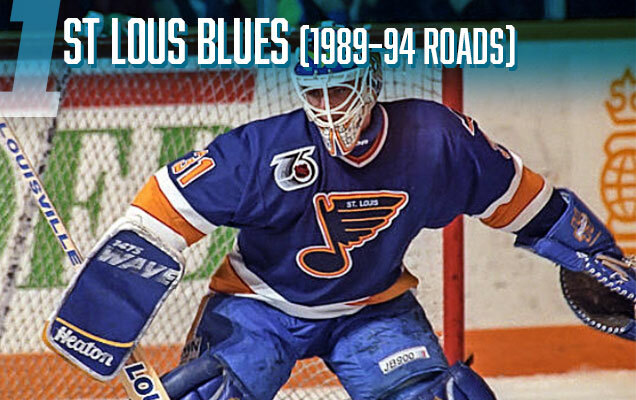 Hands down the best Blues goalie mask in franchise history. Damn autocorrect!!! I meant Cujo, not Cutoff.